The two questions I get asked most frequently by visitors to Amsterdam are: “Where should I eat Indonesian food?” and “Where should I eat Dutch food?” (Well, that and: “Where should I go with my stag/hen/bachelor/ette party?” but I generally ignore them.) And lately, these questions haven’t been all that easy to answer. Indonesian food seems to have gone downhill since I first started eating it (or maybe I’ve just gone uphill as my standards have increased). 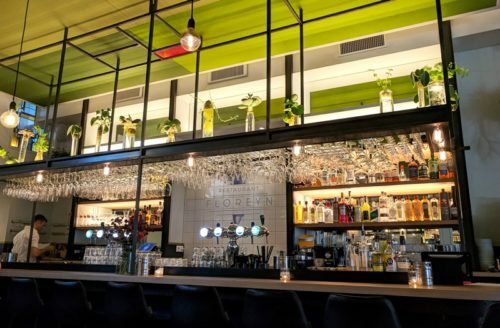 And while there are a few good Dutch restaurants in Amsterdam, many of them are very traditional – not somewhere I’d necessarily want to go back to myself. 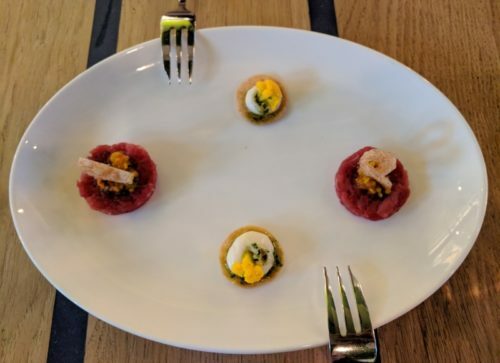 With our “Cumin Granny” (a G&T involving apple and cumin – surprising, fresh and savoury), we nibbled on tiny cauliflower cookies with pistou, and “Dutch” beef tartar with sweet pickles and crispy pork skin (to be fair, I’m not entirely sure what was Dutch about this). Both were delicious, but the bread with goat butter was an even bigger hit. Bread and butter done well are unbeatable – period. 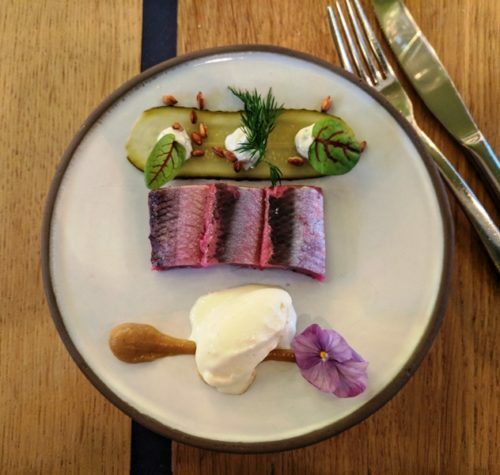 But on with the first of six courses: rollmops (pickled herring) had been cured in beetroot and came with horseradish yoghurt, dill cream, pickle (a vinegary theme going on here) and crunchy grains of rye. For pickle lovers, it was heaven. Next came possibly my favourite dish – almost undoubtedly because it contained Messeklever cheese. In a bitterbal. Two of the best things about Holland in a ball – what’s not to like? 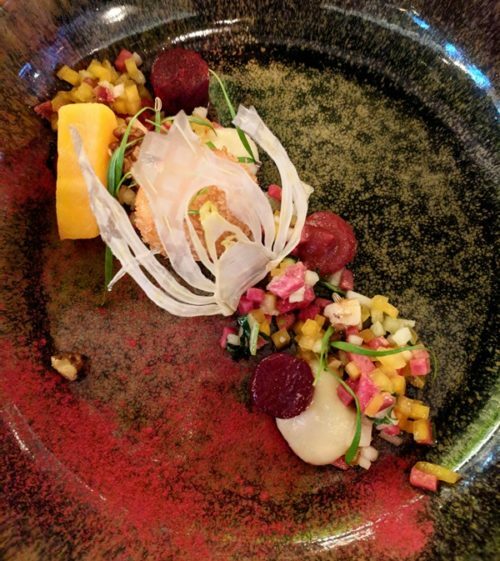 In this case, the ball came with a veritable medley of colourful produce: beetroot, fennel, radish, possibly apple – all cut and cooked in a variety of ways. Oh, and some of the beetroot was smoked (note to self: must try smoking beets at home…). Things got even more Dutch at course three: a deconstructed mustard soup. Unlike the usual creamy variety, this was a clear broth: a salty, fiery rock-pool covering brightly coloured sea anemones, which also – surprise, surprise – turned out to be mustard. 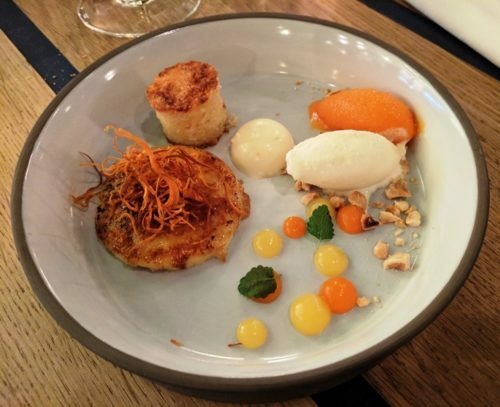 At the table, the waiter added a third element – a cheesy foam – and crispy rinds of pork belly. Simple, elegant but with a huge hit of flavour. 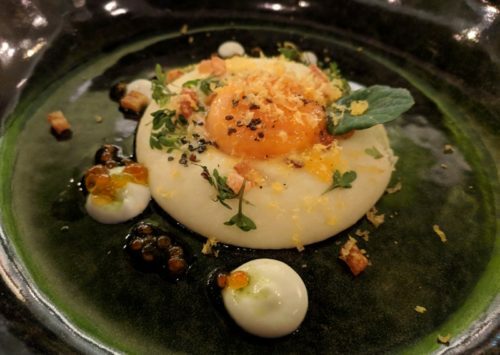 The next dish looked like “just an egg” (as one helpful Instagram follower pointed out), but was in fact anything but: the “white” was a fine potato mousseline, topped with a slow-cooked egg yolk and crispy cubes of potato that almost tasted like bacon (perhaps they’d been fried in bacon fat). Around the side was goat’s milk hangop with tiny sea-flavour bombs of salmon eggs. 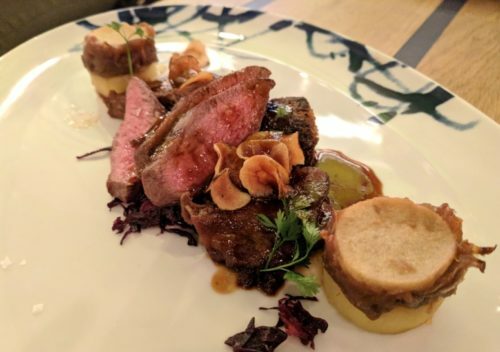 Our meaty main comprised venison fillet and neck with a ball of black pudding (blood sausage), braised red cabbage and hete bliksem – usually a potato and apple mash, but in this case constructed as a sort of gratin with caramelised onions separating the potato from a disc of apple. It was a classic late-winter dish, and possibly the most traditional of the evening, but elevated to greater heights by the quality of the game jus that pulled it all together. Dessert used seasonal vegetables to equally spectacular effect: Dutch hutspot (usually a savoury mash of root veg and onions) was reimagined as carrot and parsnip ice cream, crème brûlée with crispy ribbons of sweet carrot and onion on top, a moist orange cake, and a white chocolate panna cotta. It was an excellent marriage of sweetness – natural and otherwise – with citrus. The paired wines we drank were perfect in every case – but I’d advise asking for half glasses if you plan to get anything done the next day, as our waiter had a generous pour. Had we been paying the bill ourselves, dinner at Floreyn would’ve come to €75 all in – which is pricy but good value. And more importantly: it’s Dutch food at its very best.